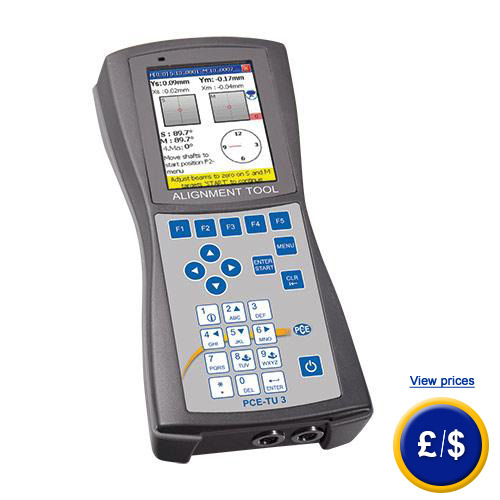 The shaft alignment tool PCE-TU 3 is designed for the optical alignment of shafts in facilities and machines. This shaft alignment is meant to check the shafts in machines and facilities to optimize them. By means of the shaft alignment tool PCE-TU 3 the relative position between two coupled machines, like e.g. engine and pump can be alternated to the point that the axis line of the shafts align during common operation. The measuring process with the shaft alignment tool PCE-TU 3 is based on two laser probes, which measure the vertical and horizontal displacement and angular deviation. Other parameters e.g. the thermal expansion and tolerance can be included into the measurement process of the shaft alignment tool PCE-TU 3. Spacer discs can be simulated by means of the shaft alignment tool as well. 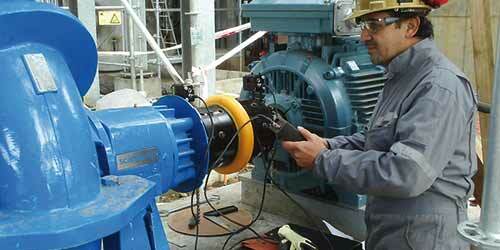 Other functions include the soft foot measurement, cardan shaft - mode and plain-grade of surface. After measuring these parameters, the measured data is shown on the large display of the shaft aligner before they are stored on the 2 GB data memory card. Those data can be sent via USB or Bluetooth easily to a computer, where they can be further processed, analyzed and archived. The supporting analyzing software is included in delivery. If there are any questions about this Shaft Aligner please have a look at the technical specification below or call: UK customers +44(0) 23 809 870 30 / US customers +1-410-387-7703 0. Our technicians and engineers will gladly advise you regarding all shaft-aligners and all products in the field of measuring instruments, regulation and control and scales. Here you can see the Shaft alignment tool PCE-TU 3 during alignment of a machine.